This classic carol is served with a hot side of grits! 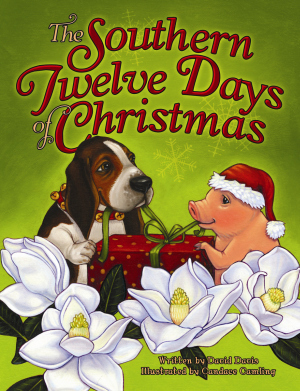 In this adorably Southern take on The Twelve Days of Christmas, gifts are presented to someone’s “sugar.” Southern goodies and traditions fill the pages, including a porch swing by a peach tree, two plates of grits, three skillet lickers, four pecan pies, five southern belles, six steamboats steaming, seven catfish jumping, eight pickers picking, nine hounds a-howling, ten praline poachers, eleven piglets prancing, and twelve magnolia blossoms. Sing along in joyful Southern style year after year with this entertaining cast of characters! David Davis, known for his keen sense of humor and lyrical style, has written several titles in Pelican’s Night Before Christmas Series, including Redneck Night Before Christmas, Trucker’s Night Before Christmas, and Nurse’s Night Before Christmas. His books Ten Redneck Babies and Jazz Cats were named to the Children’s Choices Top 100 List. A finalist for the Texas Golden Spur Award, Jazz Cats is also a selection of the Accelerated Reader Program. Davis has published pen-and-ink artwork, cartoons, poems, humor, and short stories in various magazines and newspapers. He won the Mississippi Press Association award in 1996 for his political cartoons. An active speaker and presenter, Davis lives in Forth Worth, Texas. Candace Camling teaches children’s classes at Des Moines Art Center. She graduated as the valedictorian and as a Studio Excellence Award-winner from Kendall College of Art and Design with a BFA in illustration. Camling is the recipient of two Gold ADDY Awards. She is also the illustrator of The Twelve Days of Christmas—in Texas, That Is, also written by David Davis and published by Pelican. She lives in Des Moines, Iowa. We who grew up in the South, enjoy a regional twist on a favorite Christmas song. Surely our customs are preferable to anyone elseâ€™s traditions.